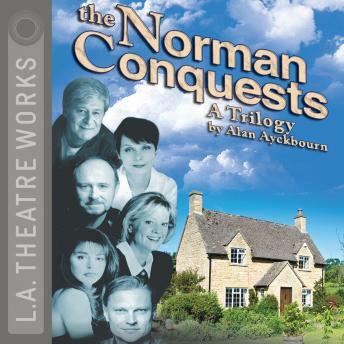 Ayckbourn’s celebrated trilogy The Norman Conquests - three hilarious and poignant plays depicting the same six characters in one house over one weekend, namely Norman and his romantic follies. England’s famous seducer of other men’s wives lays siege to his sister-in-law in the first “battle”. A middle-class family trying to have a pleasant country weekend is no match for Norman, who horrifies everyone by doing exactly as he likes. In the second “battle” Norman gets drunk on homemade wine – and all hell breaks loose. He unleashes his merry brand of manipulative charm on the hapless guests and even his most formidable opponents go down in defeat on the drawing room rug. In the third “battle” the setting is Mother’s overgrown English garden, where something more troublesome than brambles lurks among the roses. Havoc ensues as this satirical masterpiece makes its way to a hilarious conclusion.